VANCOUVER, BRITISH COLUMBIA--(Marketwire - Oct. 12, 2010) - TintinaGold Resources Inc. ("TintinaGold" or the "Company") (TSX VENTURE:TAU) is pleased to announce that it has received initial assay results from the 2010 drill program on its Sheep Creek Copper-Cobalt property ("Sheep Creek") located in Central Montana, USA. The Company has received preliminary assay results for two holes at its Sheep Creek property in central Montana, USA (see Table 1, below). Final assay results for drill hole DDH SC10-002 are still pending and DDH SC10-004 is currently being drilled. All four holes drilled to date (two reported on above, and two in progress) have encountered a rich copper zone with bands of massive chalcopyrite up to 5 cm thick concentrated within a fine grained massive pyritic sulfide layer in a shale and debris flow conglomerate host (see Figure 1, below). Assay results for the remaining mineralized zones are pending. Jerry Zieg, Vice President of Exploration, said "The Sheep Creek prospect offers an excellent opportunity to outline a high quality, underground minable copper resource of significant grade and tonnage, in an area with good infrastructure, year around access, and available power". Jerry Zieg, Vice President of Exploration for the Company is a Qualified Person for the purposes of National Instrument 43-101 and has reviewed and approved the information of a scientific nature contained in this news release. The Sheep Creek deposit sits 27 km north of White Sulphur Springs along maintained gravel road and within two miles of U.S. Highway 89. The Sheep Creek property consists of approximately 4,714 acres of fee - simple lands in central Montana. The property contains sediment - hosted zones of massive sulfide mineralization originally explored by Cominco American Inc. and BHP during the 1980's and early 1990's. 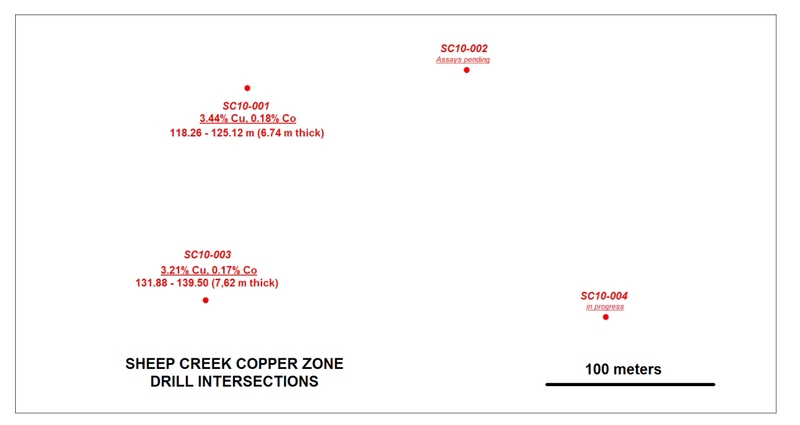 The drilling undertaken by Cominco American Inc. and BHP had encountered significant zones of stratabound copper sulfide with cobalt in multiple bedded pyrite zones in the lower part of the Precambrian Belt/Purcell Supergroup; this same stratigraphic unit hosts the Sullivan zinc-lead-silver deposit. TintinaGold is a growth company focused on the exploration and development of precious and base metal properties around the world. The Company's experienced management team has assembled an impressive portfolio of gold and base metal projects in Alaska, including the Colorado Creek gold project, located in southwest Alaska approximately 100 miles northwest of the 40 million ounce Donlin Creek project and the Kugruk copper project located 70 miles north of Nome in the northern Seward Peninsula, Alaska, and the Sheep Creek copper-cobalt property in Montana. The Company, in a short period of time, has successfully established itself in several of the most prolific mineral belts in North America. Cautionary Note Regarding Forward-Looking Statements: Certain disclosure in this release, including statements regarding the Company's plans for and intentions with respect to exploration of the Company's Sheep Creek property, constitutes "forward-looking statements" within the meaning of the United States Private Securities Litigation Reform Act of 1995 and Canadian securities legislation. In making the forward-looking statements in this release, the Company has applied certain factors and assumptions that the Company believes are reasonable, including that the Company is able to obtain any government or other regulatory approvals and any financing required to complete the Company's planned exploration activities, that the Company is able to procure equipment and supplies in sufficient quantities and on a timely basis, that the Company's exploration activities on the Sheep Creek property will not be affected by actions of environmental activists or other special interest groups, and that actual results of exploration activities are consistent with management's expectations. However, the forward-looking statements in this release are subject to numerous risks, uncertainties and other factors relating to TintinaGold's operation as a mineral exploration company and the Sheep Creek property that may cause future results to differ materially from those expressed or implied in such forward-looking statements. Such uncertainties and risks include, among others, actual results of the Company's exploration activities being different than those expected by management, uncertainties involved in the interpretation of drilling results and geological tests, delays in obtaining or inability to obtain required government or other regulatory approvals or financing, interference with TintinaGold's exploration activities by environmental activists or other special interest groups, inability to procure equipment and supplies in sufficient quantities and on a timely basis, equipment breakdowns and bad weather. There can be no assurance that such statements will prove to be accurate, and actual results and future events could differ materially from those anticipated in such statements. Readers are cautioned not to place undue reliance on forward-looking statements. TintinaGold does not intend, and expressly disclaims any intention or obligation to, update or revise any forward-looking statements whether as a result of new information, future events or otherwise, except as required by law.